nice wallpaper, the chara is cute and the feathers there look nice but the colors of the text don't quite fit in. Aww! Very cute indeed! 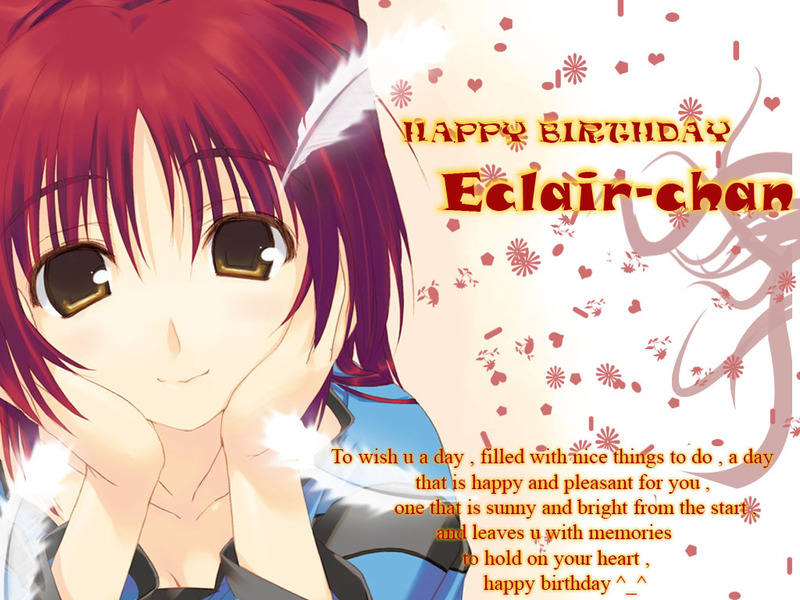 Happy birthday, Eclair-chan! i think you could've used a different text, since its a little bit simple. but otherwise lovely work, the simplicity of the background looks pretty good, and it reminds be of a bday card. and the chara blends really well with everything. I really like the feathers and the text. Nice work uchiha-vegeta. omg kawwai! *tackles to a hug* thank you so much! it wonderfull XD I love it!,especialy the scan thanks so much! *huggs* this is my new desktop wallie XD+favs! 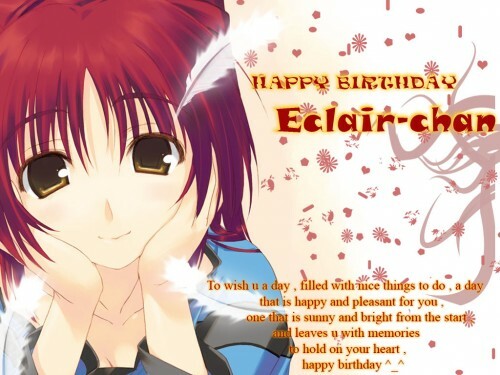 Happy birthday eclair-chan hahaha, and cool stuff uchiha-vegeta! That is soooo sweet, really its a nice action. Oh so you've got a soft side aye uchiha. .::nudge,nudge::. Just foolin with ya, what person doesn't have a soft side. Oh and Happy Belated Eclair-chan. Don't know ya but hope you had a good one. Anyway, this is a nice wall dood. You done good as always. And someone else said something about the color of the font...I kinda see what they mean. Oh well, no biggie right? Well thanks for sharing Uchiha, can't wait to see some more from you.